Okay, so you know you want an automatic, self-cleaning, litter box for your kitty, but you are too overwhelmed with the numerous products out on the market right now. Well let’s compare two right here, right now! The Open Air Litter Robot is the newest product from AutoPets and it is quickly becoming a fan favorite. The LitterMaid Classic Mega self cleaning litter box trails right on the Open Air’s heels (or paws). So let’s get to it and see how they stack up against one another! May the best litter box win! A comparison between the LitterMaid vs. the Litter Robot. So you open the box, what's next? Easy setup, no tools required, assembly within minutes Fresh out of the box, it comes fully assembled (miracles do happen)! We say the Open Air Litter Robot wins this one. No offense to the LitterMaid , but it requires more setup and it is quite an eyesore compared to the Open Air. Verdict: Litter-Robot Open Air due to its quick and easy setup and techy-looking body. The Open Air Litter Robot and LitterMaid have very similar features. They also both require that you use any brand clumping litter, which is nice and easy for pet parents. In our opinion, the Litter Robot III Open Air wins because of its programmability. With this device you can choose for it to auto clean itself as fast and 3 minutes after your kitty exits. This is an amazing feature if you have multiple cats that like to “go” right after one another. Verdict: Litter-Robot Open Air due to its convenient programmability. 3) Let’s talk about PRICE. Okay.. so the takeaway.. initially the Litter Robot III Open Air will cost you, but in the long run it will save you money and even something money can’t buy - your precious time! Verdict: TIE Littermaidfor its short-term cost-saving effects, but Litter-Robot Open Air if you're in it for the long-game. Let’s get to the fourth point where we talk about how much less effort you need to put into the Open Air vs. the LitterMaid. 4) But will these self-cleaning, automated machines actually save you time? You rarely need to check on this machine. Only towards the end of the week. It has an LED blue light indicator, which turns on when waste bin is full. Because of its globe structure, kitty never pees on any parts to compromise the machine’s ability to clean. Kitty likes a clean box every time and with the Open Air you will never have to worry about the device being dirty or malfunctioning. You never know when the waste bin is full, unless you manually check on it. Many customers report problems and they wind up having to troubleshoot and manually clean the device. Cats often pee on the components. Soft poopies get stuck to the moving rake, making a big mess that requires cleaning. Often the rake just breaks apart the waste, in turn nothing gets into the waste receptacle and yet again you find yourself manually cleaning the machine. Bottom Line: After extensively searching the web for consumer reviews, the Litter-Robot Open Air wins by a landslide and the Classic Mega falls flat. Womp. Verdict: Litter-Robot Open Air due to its good reviews and extra features from other websites. 5) And ... just in case ... let’s talk about warranty! Is the above warranty not convincing enough?? The people at AutoPets want you to be so satisfied with your Litter Robot III Open Air that they give you a 90 trial period, so you and Fluffy have time to fall in love with it. If you and Fluffy are not happy with it, just send the unit back within the 90 day period, pay for postage, and forget about it. Verdict: Litter-Robot Open Air due to its warranty being more extensive and comprehensive. Can the LitterMaid Classic Mega keep up? The LitterMaid has a 1 year warranty attached to it. This warranty states that no matter what, you are 100% responsible to cover all postage, even if there is a defect with the device. Also, this litter box is not covered for accidental damage. Sadly the LitterMaid Classic Mega cannot keep up with the Litter Robot III Open Air and it loses in this matchup. The Open Air is a tad noisy, but nothing unpleasant to the ears. It sounds like something is rotating (duh) and can be comparable to other humming devices. Now the LitterMaid Classic Mega is definitely more noisy. The rake part of it, which is the part that sifts the waste, sounds like a drill! Totally unpleasant and screechy like. We were hoping that the LitterMaid would win in the noise department, but sadly it does not. The Open Air wins again. Verdict: Litter-Robot Open Air due to its quietness, you won't even know it's there! 7) Okay cat lovers let’s cut to the chase! Who is the winner in this litter box face-off? Drumroll please . . . . The Litter Robot III Open Air is the winner! Kind of a no brainer based on our analysis. Many customers reported the LitterMaid Classic Mega a failure, and not worth their money. We had higher hopes for the LitterMaid, but I guess all litter boxes can’t be created equal. 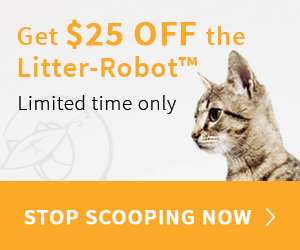 The Litter Robot III Open Air is the clean winner here and definitely worth the purchase. Especially with its 90 day trial period, if you have given up all hope on your kitty’s current litter box situation, the Open Air could very well be the answer you were looking for.